My first personal experience with a dog was when I was seven years old. My family and I rented a small lake cabin in Indiana for vacation. The cabin was small, quaint, across the street from a small lake, and was constantly filled with mosquitos every night. Nevertheless, it was a vacation, and there was water to splash in, so I was happy. Shortly after we arrived, I met HIM. He was a very mangled-looking dog. His hair was dirty, and he was missing an eye. Yet his heart was full of love, and he decided, upon seeing me, that I would become his best friend and he started following me around all the time. Every day. By my side. Of course, I fell in love with him, the dog that no one else wanted. The dog with no eye. We became best friends, and I returned his love with my own, petting him, hugging him, and watching over him. Eventually, we had to drive home to Illinois, and I remember that I begged my parents if we could keep him, take him with us, to save him from this sad life he had. They said no - we just couldn't afford it and were not prepared to take on the responsibility of dog ownership. But that didn't stop me from loving him, and from that time on, I knew I wanted to save innocent animals. Fast forward 35 years. My husband, daughter, and I wanted a dog. There was only one option - rescue a dog from a local shelter. A few months later, I found HIM. Not the same dog from Indiana, but the dog that was meant to be ours to save. He was a six-year-old cockapoo that was rescued by a local shelter from a high-kill shelter in Kentucky. He was going to be euthanized soon in Kentucky, but this local shelter took him in. When I saw his photo, he looked like the dog from Indiana, strangely. We adopted him, and gave him a new life. His name is now Chewie and he has the best life with us. Just like they say, not only did we save him, but he saved us too. His unconditional love, kindness, playfulness, and loyalty brought new joy into our lives. He is part of our family. I am not the kind of person who does marathons, walkathons, etc. but I decided to do this one, for the first time, at age 42. Why? Because I believe so very much in its cause. There are countless animals who are abused, and they can't help themselves. We need to help them, to get them out of their dangerous situations, to give them food and drink and shelter, and to get them healthy again, and get them to love again by loving them unconditionally. Because they deserve it. Just like the dog from Indiana. And just like Chewie. Will you please help me? 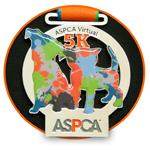 Your donation will help the ASPCA provide life-saving programs and services to millions of animals worldwide. Please join me as I fight to give abused and homeless animals a second chance at life by making a donation. R.I. P. Czarus, my parents' dog, was a rescued beagle. He was a very loving and loyal dog, and my parents gave him a happy adulthood. He died from cancer years ago.